Come out to Chipotle on 242 on your way to our Booster Club Meeting! This is a QUICK & EASY way to support our AMAZING Reveliers! All you have to do is eat dinner at Chipotle and tell them you are with the Revs! Friday Night Lights & Homecoming Game!! It's our 1st Home Game of the season!!! You can't miss this incredible game. Homecoming and our AMAZING Reveliers, Band and Cheerleaders! Come out and support! All of our feeder schools will be there to show off their school float! This year's theme is "Monte Carlo". The Reveliers will perform too! Plus the Band will show off what they have been working on! May 1st-4th 4:30-6:30 p.m. Tryout Clinic in the TWCP Gym. 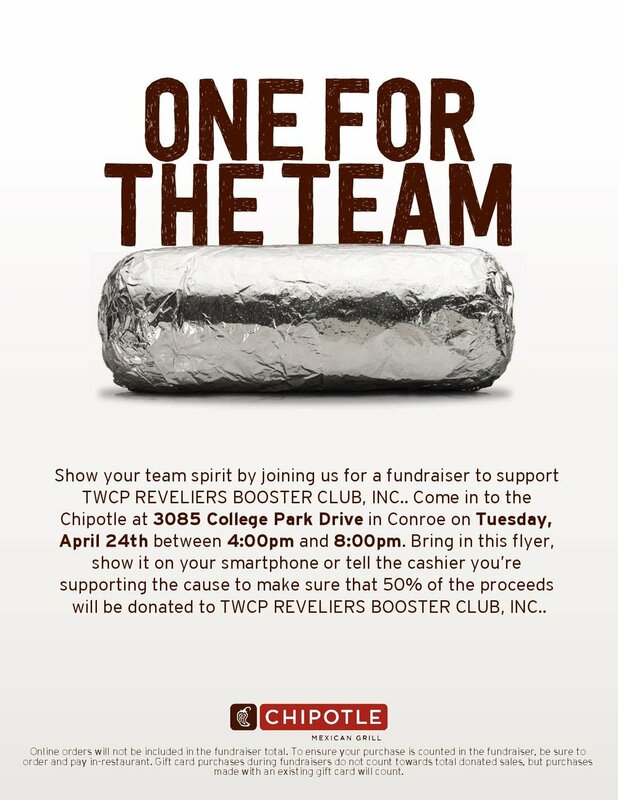 Come support the Reveliers!! Mark your calendars! TWCP will show their school spirit for the "Blue Out" Pep Rally!!! Wear all blue, and don’t forget the accessories! Come do your Christmas shopping at Kendra Scott and support The TWCP Reveliers! It's senior night at the football game!